Here your teeth are whitened in the dental chair. A protective barrier is placed on your gums and lips, and a gel is placed on your teeth. 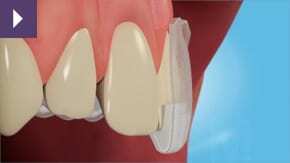 A lamp is positioned over the teeth and this activates the bleaching process. Watch this clip to see how it works. After one hour you can expect your teeth to look a few shades brighter and is a popular choice with many patients who have an important event coming up where they want to look their best. Our teeth whitening Liverpool service can reverse years of tooth staining.